Immaculate Yossa, Regional Advocacy Officer Eastern Africa Hivos presented our experiences of multi-stakeholder action with the Uganda Food Lab at CFS. After decades of decline, hunger is on the rise again; 821 million people don’t have enough food and more than one third of the 7 billion people on our planet are unwell or will become unwell because of what they eat. Most do not have access to a healthy diet and many eat too much of the wrong types of food. Our planet is in bad shape too. Biodiversity loss is increasing. Only 30 crops supply 95% of the calories we consume. This undermines the ability of agriculture to adapt to climate change. Greenhouse gas (GHG) emissions from the agri-food 'value chain' account for one quarter of all human GHG emissions, and about one third of all food produced is lost or wasted. In addition, the two billion women and men who grow, pick and pack our food, often do not receive a living income. The true cost of food is not included in the investment and policy decisions made in relation to food. The outlook is grim. To ensure we reach the Global Sustainable Development Goals in 2030 we need a dramatic change. Success will depend on our ability to collaborate on a wider level. 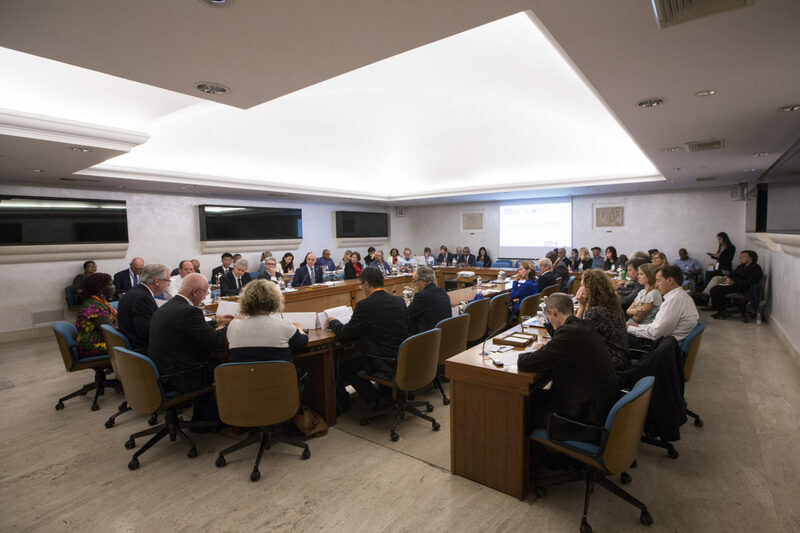 Engaging multiple actors to transform the food system was the focus of this year’s Committee for Food Security (CFS) meeting in Rome earlier this month. Together with WWF, and the governments of Switzerland and South Africa, Hivos organised a side event to demonstrate how multi-stakeholder collaboration among food system actors, particularly women and low income producers and consumers, can promote action towards better food and nutrition security. The side event was part of the Sustainable Food Systems (SFS) programme of the United Nations One Planet Network putting SDG12 in action. The SFS programme was highlighted in the recent HLPE report on multi-stakeholder partnerships which was discussed at CFS. Immaculate Yossa, Regional Advocacy Officer Eastern Africa Hivos presented our experiences of multi-stakeholder action with the Uganda Food Lab. The Uganda Food Change Lab is an example of the type of multi-stakeholder collaboration that we need. Kabarole Research and Resource Center (KRC), with the support of Hivos and the International Institute for Environment and Development (IIED), convened the Lab as a multi-stakeholder partnership with participants from Fort Portal town and Kabarole district, national policy makers and Ugandan civil society. The Lab focuses on the inclusion of citizen’s voices, particularly those not normally heard, such as women, youth, marginalised communities, and low-income groups such as farmers, street food vendors, students, and day labourers. Together, this group supports concrete interventions on the ground and advocates for a more conducive policy environment to achieve both sustainable diets and a productive, sustainable local food system. Hivos and IIED promote Food Change Labs in several countries through the Sustainable Diets for All programme. We’ve learned some key lessons about making collaboration work. As it is complex and very context-specific, every facet of the food system needs to be approached in a different way. Connecting multiple stakeholders with various interests within a specific food system helps to gain a deep understanding of the local issues, before co-designing solutions. The Lab approach builds flexibility into the process by using collective learning as the primary driver for adaptation. Get the right people at the table: Involving key actors whose voices are rarely heard in policy making is crucial in making their food system visible to policymakers and ensuring correlation between policy and local realities. This includes small-scale producers and low-income consumers, including women. On the other hand government officials and private sector actors need to be involved to influence the system. It is important to acknowledge and address power imbalances through inclusive governance structures, clearly define roles and responsibilities, and identify potential conflicts of interest. Trust among participants also needs to be developed from the start. The role of the convener is critical. Given the complexity of food systems, the sub-national platforms are most likely the most inclusive. Share your knowledge, capacities and networks: It is important to create an internal learning culture and to be transparent about successes and failures. Commit time and resources to monitoring and evaluating the process and the outcomes. Knowledge sharing can be promoted internally and supported by external organisations, if needed. Capacity development is key, especially for those with the least experience. Hivos developed the Advocacy Toolkit to support civil society organisations in initiatives and advocacy. Invest in longer term processes: Multi-actor processes inherently have huge costs. It takes time and resources to develop a joint vision, an inclusive governance structure and to co-create and test out concrete actions. Long-term investments are needed to strengthen inclusiveness, transparency and accountability. Donors need to be open to investing in long-term processes when potential results cannot be defined upfront. Frank Mechielsen is Programme Manager Sustainable Diets for All at Hivos.